Getting rid of mold doesn’t need to be complicated. As thousands of customers may remember Cleaner Today previously offered MoldSTAT Peroxy Kling , MoldSTAT Plus and MoldSTAT Barrier. Plus is a concentrate, but both Peroxy Kling and Barrier came as Ready-To-Use sprays. MoldSTAT Commercial : Step 1 – Cleaner – Kills Stains caused by mold and mildew , packaged in a 16oz concentrate that makes 32 oz ( 1:1 mix with water). It;s still powered by hydrogen peroxide, just concentrated. 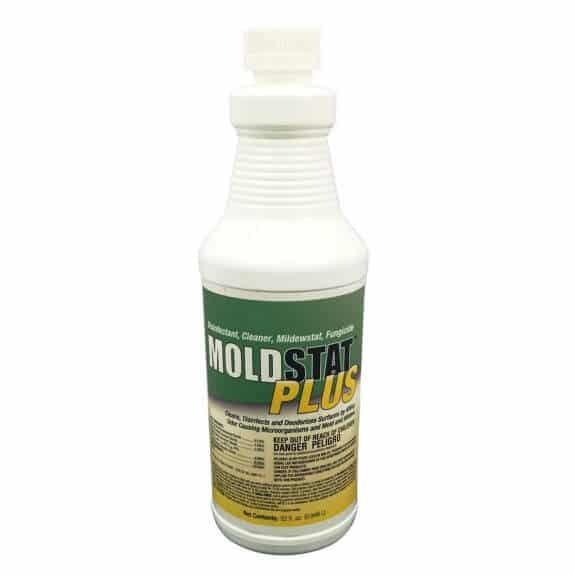 MoldSTAT Commercial : Step 3 – Protector – creates an invisible barrier keeping surfaces mold free up to 3 months, packaged in a 16oz concentrate that makes 144oz ( 1:8 mix with water). This entry was posted in Black Mold Removal Reviews and tagged barrier, cleaner, mold cleaner, mold killer, moldstat commercial, moldstat plus, protector.